So this is Memebox Hair and Body 3. I had been impressed with Hair and Body 1, so I got Hair and Body 2. That one was pretty meh. So is this one. To me, anyway. It's actually not that bad. Maybe I'm just basking in the glow of the amazingness that was my last box and comparing unintentionally. This Memebox was originally $23 and is currently sold out. 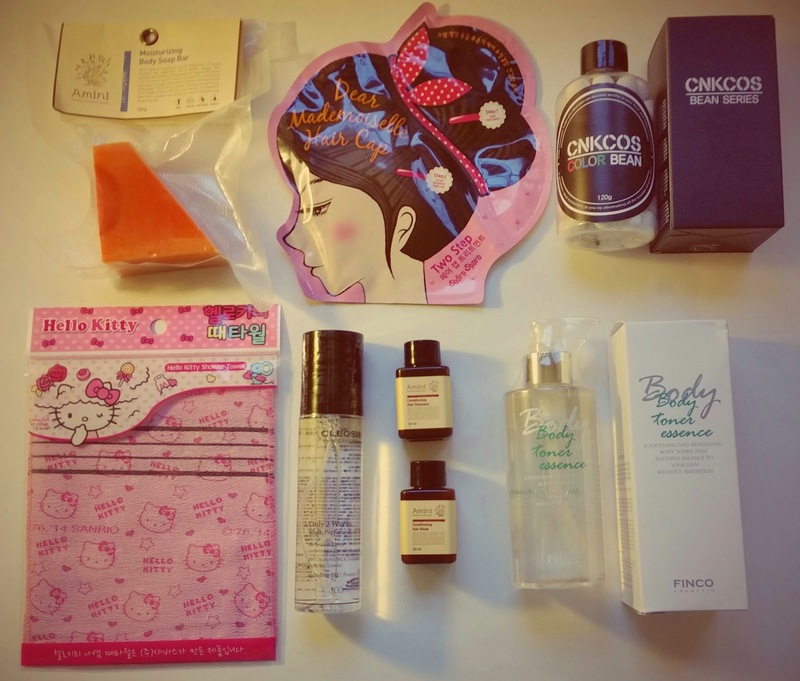 "We’re finally back with another Hair & Body Box, but this time, its Korean Spa style! (#JJIMJILBANG) This Hair & Body Box is loaded with delightful and unique hair and body essentials for chilling at the Korean Spa! Unwind with intensive hair treatments, bath tub soakers, body scrubbers, and more fun and unique Korean ideas for a full 3 hour body relaxation session! Use this step by step Korean Spa newbie "how to" and revel in Korean spa bliss! We'll provide you with a total head to toe spa care treatment right in your own home! You don’t need to go to a Korean Spa to experience Korean spa bliss, just open this Korean Spa-in-box and all you need to prepare are some boiled eggs and #yangmeori! 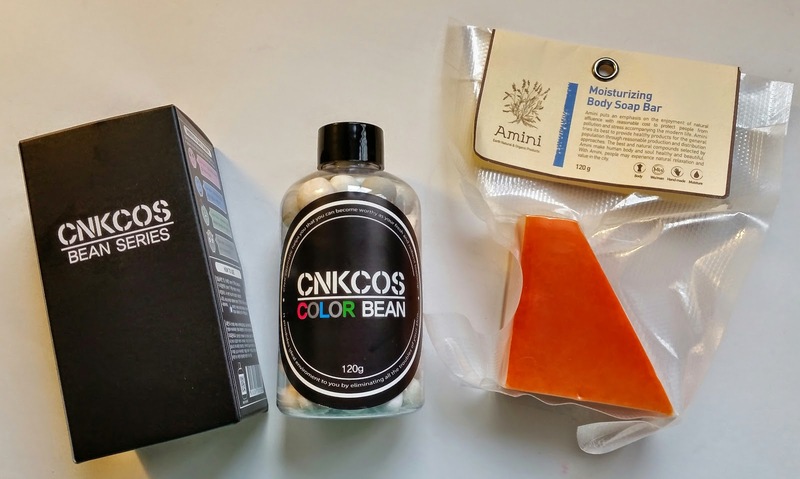 (sheep head towels)"
CNKCOS Multi Cleanser Color Beans-120g- These work as a makeup remover, facial cleanser, a scalp shampoo, body wash, hand wash and a face and body scrub. Use 1 bean with water for your face, use 2-3 for your scalp, 3 for a bubble bath, 1-2 for a shower and 1 for a hand wash. I'm not sure how I feel about these beans. I used one and it has the strangest texture. Once it's wet it's almost a little sticky but it does have a little bit of foam once you crunch it up good. Amini Moisturizing Body Soap Bar-120g-This is another Amini soap bar. I received one in the Vitamin box and that one was different but the description was better since it explained what it was made of. This one doesn't say anything about that. There is a possibility of getting Recovery or Nutrition as your bar, too. This one is Moisturizing. Its a funny shape but it is quite a big chunk of soap! Shabath Hello Kitty Massage Towel-This is a Hello Kitty printed Korean beauty essential. If youre taking a bath at home or in public, you need one of these! Wrap it around your hand and lather your soap or wash on it then exfoliate by gently scrubbing your body. Hmm, I wonder if this is the same thing as one of those Baidan mittens that cost way too much. I was reading about the towels they use and how the colors mean something. Pink is the softest. But I think they call them Italy towels and the description doesn't say that. 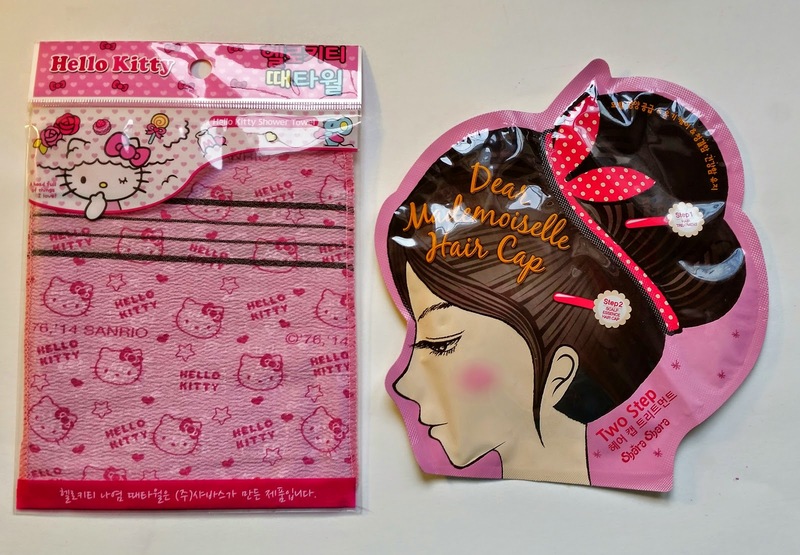 Shara Shara Dear Mademoiselle Hair Cap- This looks like fun! It's a treatment and a hair cap! After you towel dry your hair, you apply the treatment to your hair, tie your hair up and then put the cap on. Then you massage your hair and head through the cap to get the essence into your scalp really well. Then rinse after 30 minutes. Thats a lot of showering but it sounds fun! This is for dry or damaged hair so stay away if you're oily, I guess. Cleosis Musk Perfume Body Mist-100ml- Infused with a delicate musk fragrance, Cleosis popular perfumed body mist is for soothing and replenishing dry, sun-exposed skin. Also, it's good for covering sweaty odor. These descriptions make me laugh sometimes! This is a body mist and it smells pretty good. I don't know if it's something I would use a whole lot, though. 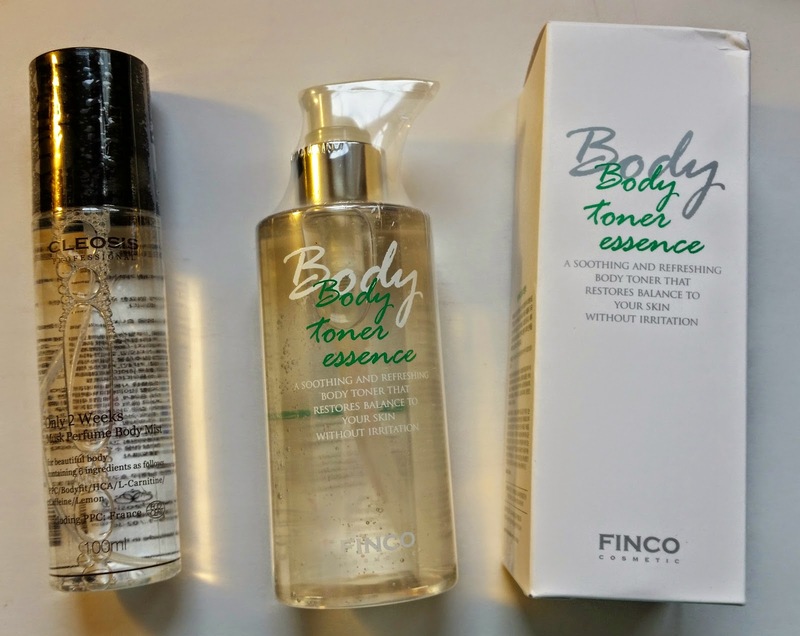 Finco Body Toner Essence-200ml- This is a gentle, fast-absorbing toner essence that will smooth and brighten your skin. It's infused with fragrance for a nice bodily scent. After a shower, pump out essence and massage onto your body. Free of animal oil, parabens, mineral oil, and some other things. This isn't really my thing either. Mainly because the ingredients aren't super great. 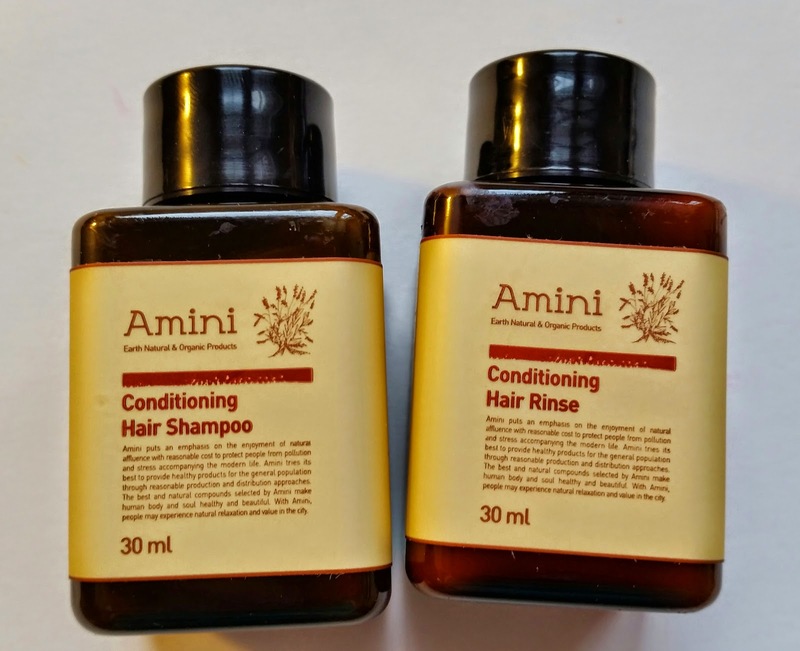 Amini Condtioning Shampoo and Hair Rinse- 30mlx2- Unfortunately, my hair rinse exploded during transit and got all over a couple other boxes. No damage, just messy. This is a travel size hair duo made with various extracts and natural essential oils. I can't find any other information about them. VERDICT: The information card for this Memebox was singularly uninformative! It barely says anything about the products and doesn't give any real ingredient or scent information. Since I'm avoiding lavender, this makes it a little rough. So. This box has a body essence, body mist, a soap bar, soap beans, shampoo and conditioner, a washcloth and a hair treatment. Why am I so bummed about it? I shouldn't be since I only paid $9 for it, thanks to codes, but this box seems... uninspired. Granted I can't expect Memebox to be super awesome like they were for Superfood for every box. I wonder if they have different people organizing different boxes! Like maybe a whole different person picked out all the goodies for the Superfood box than picked the items for this one! Hmm... Anyway, this box has a good variety and the sizes are generous although the shampoo and conditioner are travel size. Part of it is probably that I'm not a hair person but this box did have more body than hair soo.... I don't know. If you want to know more about Memebox, check out their website here. While this box might not have been my favorite, many others have! You can see a list of all my boxes with their reviews HERE. Please, write promocodes, which you use!!! The promo codes I used were only valid in June :( I haven't seen any as good as those since then. appealing thought the promo with the name of the box looked exciting( Glad I didn't purchase it. Yeah, it was the name that got me. I think I'm going to stay away from Hair and Body boxes now. You were smart not to get it! Those little Italy Towel things are seriously the BEST for getting off dead skin. They're not exactly the same as the Baiden mitt, but they're super-effective (and also way cheaper if you ever need to replace it). I use the green kind and it removes a ridiculous amount of dead skin. It's kind of gross actually, haha. :) I think with the normal towels pink is the gentlest, but maybe that's not the case because this is a special Hello Kitty towel? Who knows. Other than the print, it looks similar to the ones I have. Anyway, they work better if you've soaked in the tub or shower in hot water for 10 minutes or so first!